The Student Enterprise Programme is back this semester with another exciting line up of activities to support students to develop their entrepreneurial and intrapreneurial skills. Kicking off on the 26th of January , we are thrilled to be joined by a number of internal and external guest speakers for our skill-building workshops. These sessions offer attendees the chance to gain knowledge and skills from each of the speakers on a range of areas and issues that matter in business and learn best practice from their experience. For more on our events, visit our event page. Also taking place this year is the University’s annual student idea and start-up competition, the Entrepreneurial Quest, which takes place on the 15th of March. Participants of the ‘Quest’ deliver three unique pitches to three expert judges in the respective areas of finance, marketing and overall business idea. Each judge provides immediate individualised feedback, which means that there is nothing to lose by participating. In addition to receiving impressive prize packages, winners of the Quest will also represent Stirling in Santander’s national competition, Santander Universities Entrepreneurship Awards. If you are interested in participating and/or gaining more information, join Student Enterprise at their Entrepreneurial Quest info event on the 2nd of March. Participating in the Quest is a great way to develop both your ideas and your enterprise skillset. Pitching and planning are but a few key skills that you will need in order to further an idea and / or business. With many external enterprise competitions taking place during the spring and summer, an additional incentive to participate in the Quest is that it provides you with an opportunity to exercise your skills and polish ideas before applying for external support. As always, Student Enterprise Manager, Alasdair Gammack is available to meet and mentor you if you have an idea or potential competition entry. You may also wish to take advantage of his drop-in session scheduled on the 20th of March to get some extra support in advance of applying for external competitions. Look out for our blog coming soon with some hints and tips of how to make the most of your participation in the Entrepreneurial Quest and other competitions. 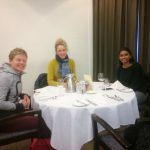 Continuing this semester from Jan to May, after generous support from the Vice-Chancellor’s fund, our monthly ‘Lunch with a Leader’ initiative provides the opportunity for up to three students to have lunch with established entrepreneurial leaders at Stirling Court Hotel and learn from their experiences. Last semester lucky student winners enjoyed meeting leaders Anne MacColl, Ross Tuffee and Alex Feechan. Our students have found these lunches to be an invaluable opportunity to gain entrepreneurial insight and inspiration. If you have any questions about the Student Enterprise Programme and/or are interested in in any of the activities and support that we offer please send an email to: studententerprise@stir.ac.uk. ‘Let’s Talk Social Enterprise’ (26th January) delivered by colleagues from Converge Challenge and our own Student Enterprise Manager, Alasdair Gammack will help students develop their understanding of social enterprise. 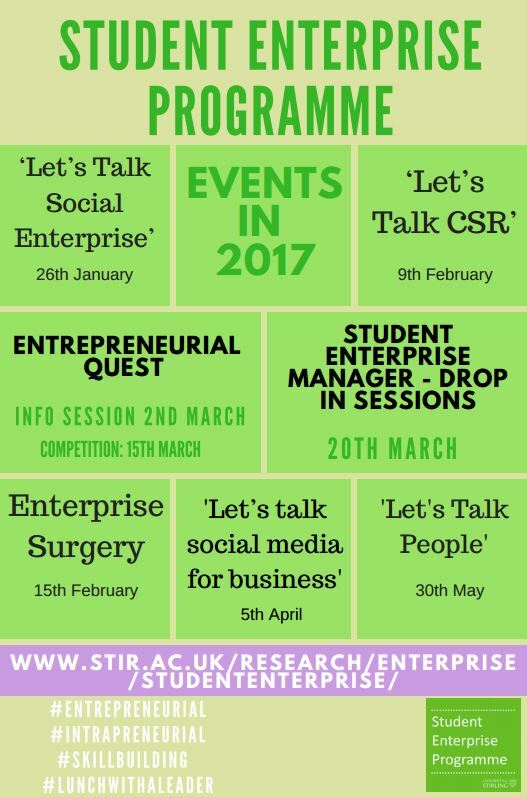 ‘Let’s Talk CSR’ (9th February) with Dr Darren McGuire (Stirling Management School) will help students to understand corporate social responsibility. Enterprise Surgery (15th of February) invites postgraduate students can join Enterprise Campus for support in developing their business ideas. Let’s talk social media for business on the 5th April, the Research and Enterprise Office’s Dr Fiona Millar will help students to understand how to utilise Social Media to benefit their business. ‘Let’s Talk People’ this discussion panel, on 30th May, will explore important aspects of building and leading a successful team.